High Picture Quality Vivid Pictures in Bright Environment – full 1920 x 1200 resolution! With up to 5400 lm of brightness, the PT-EZ580 Series serves up brilliant, punchy images even with the lights on. Text is sharp and clearly legible while graphics, photos, and video images are reproduced with a clean and natural vibrancy.High Contrast Performance with Iris. Expect dazzling highlights and inky blacks with a high contrast ratio of 5,000:1 assisted by an iris, which alters brightness according to the scene or image. With built-in Panasonic “Digital Link” HDBaseT technology, you can combine with the available Creston DM-TX-201-C DigitalMedia Transmitter and achieve distances exceeding 300′ over Cat5/6 ethernet cable. With 5400 lumens of brightness, the PT-EZ580 Series serves up brilliant, punchy images even with the lights on. 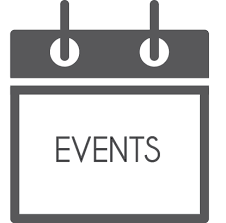 Text is sharp and clearly legible while graphics, photos, and video images are reproduced with a clean and natural vibrancy. which alters brightness according to the scene or image. PT-EZ580/EZ580L is capable of displaying Full HD video from Blu-ray Disc and other sources in beautifully rich, vivid detail. * With lamp power set to Eco. Up to 4,000 hours with lamp power set to Normal. The Eco Filter unit, which efficiently captures dust in the intake airflow path, requires no replacement for up to17,000 hours. *1 This large, pleated Micro Cut Filter (electrostatic filter) uses an ion effect to trap minute dust particles, further raising the overall dust-trapping capability. 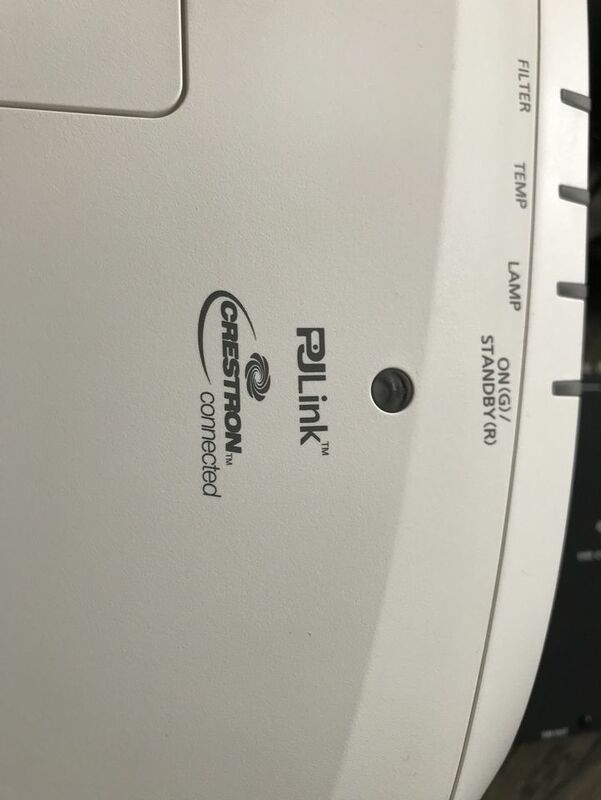 When the lamp power is set to Auto, the Intelligent Lamp Control system automatically adjusts the lamp output in accordance with the brightness of the projected image and reduces it by up to 27 %*. It also combines with color shift correction, which corrects the shift in the color balance that occurs when the lamp output drops. As a result, power consumption is effectively reduced while excellent color reproduction is maintained. Equipped with a DIGITAL LINK terminal, the PT-EZ580/EW640/EX610 allow transmission of HDMI, uncompressed HD digital video, audio and control signals (Ethernet, RS-232C) for up to 100 meters (328 feet) through a single CAT5e (STP) cable or higher. This simplifies cabling and system upgrades, making it ideal for ceiling-mounted and other permanent installations. 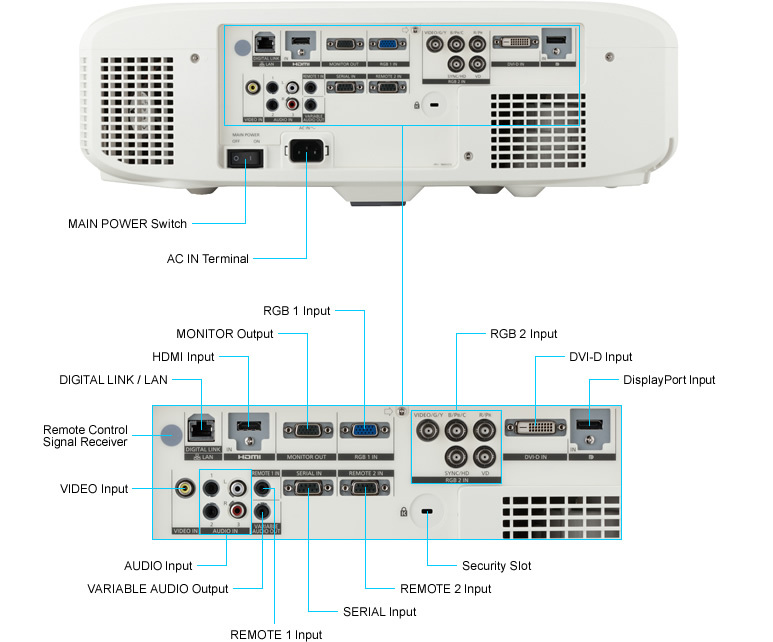 By combining the optional Crestron Transmitter, with its HDMI and other input terminals, uncompressed HD digital video, audio and control signals can be transmitted up to 100 m (328 feet) over a single CAT5e (STP) cable or higher. 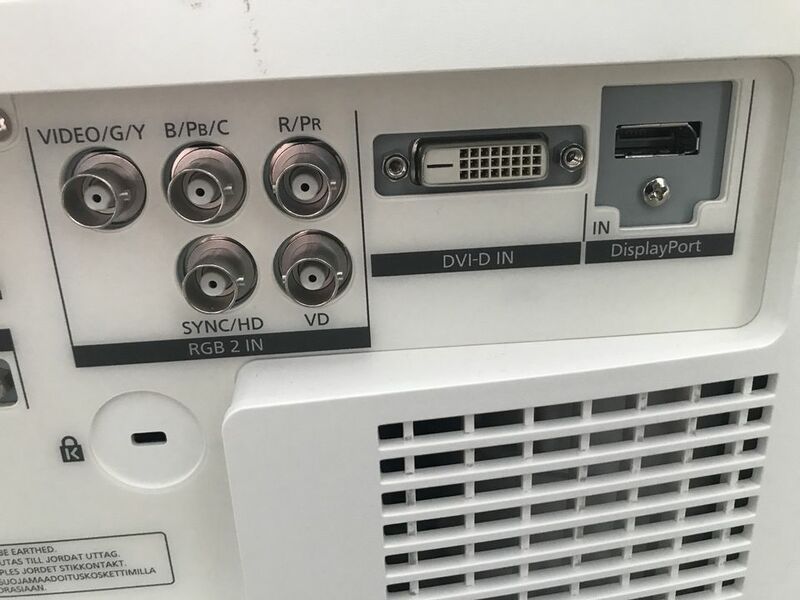 It allows projector connection with only one cable. The LAN terminal allows a computer connected to the network to use Crestron Connected™ application software to manage and control system devices. Besides, the AMX Device Discovery technology is built in the PT-EZ580 Series. 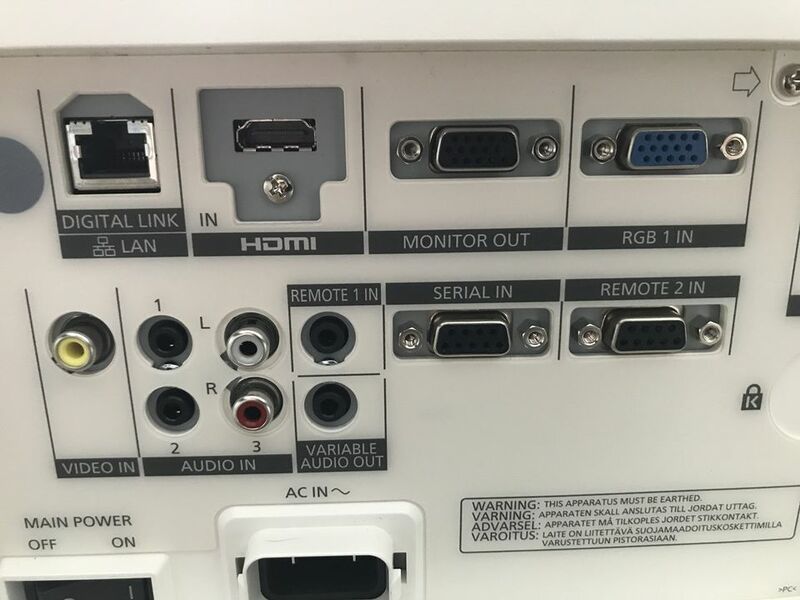 Extensive interfaces include HDMI and DVI-D input terminals, DisplayPort,*1 DIGITAL LINK*2 and two sets of computer (RGB) input terminals. 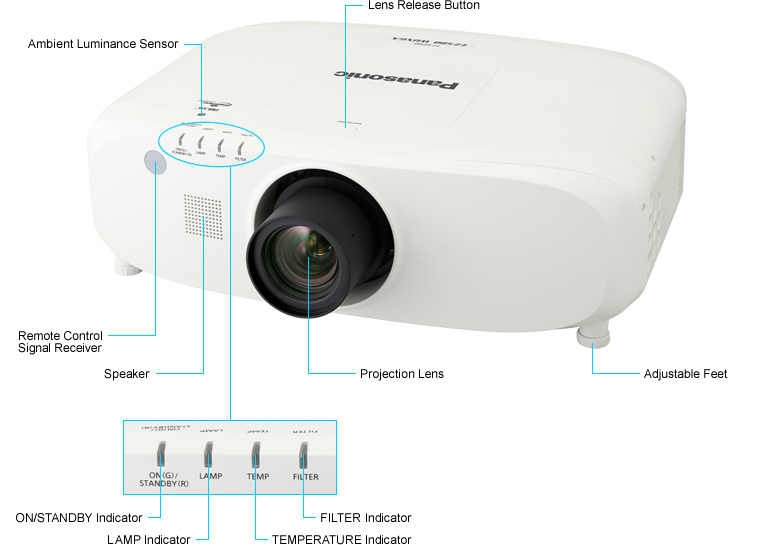 *3 And the serial terminal (RS-232C) has an Emulate function that lets you continue using existing control systems when replacing legacy Panasonic and Sanyo projectors. It is also possible to output audio during Standby mode. 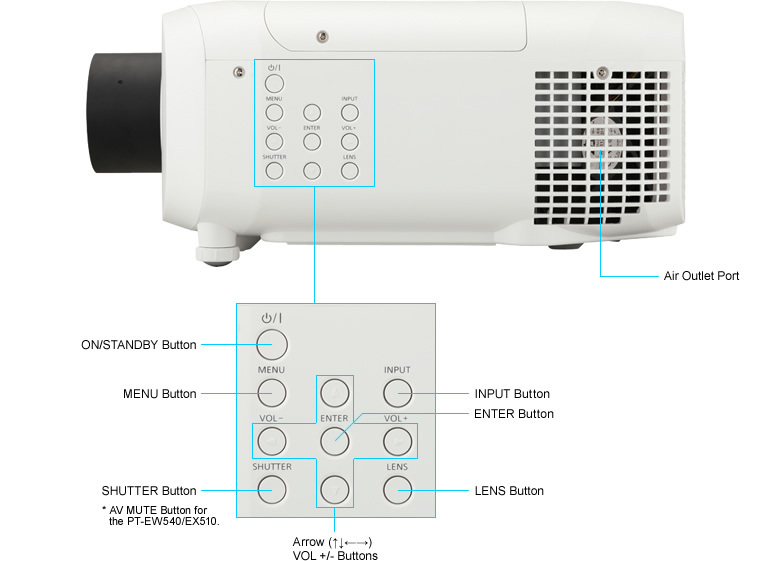 This is convenient when connecting an external audio system through the projector. *1 DisplayPort: for the PT-EZ580/EZ580L, PT-EW640/EW640L and PT-EX610/EX610L only. *2 DIGITAL LINK: for the PT-EZ580/EZ580L, PT-EW640/EW640L, PT-EX610/EX610L only. *3 Computer (RGB) input terminals supports YPBPR (YCBCR) signals. Featured image: PT-EZ580/EZ580L, PT-EW640/EW640L and PT-EX610/EX610L. * With the lamp power set to Eco. 35 dB with lamp power set to Normal. Note: This illustration shows the lens shift of the PT-EZ580/EZ580L, PT-EW640/EW640L and PT-EW540/EW540L. This lowers running costs, and helps to reduce environment impact. * Standby mode: Eco. When Standby mode is set to Eco, network functions such as standby on via LAN are not available. 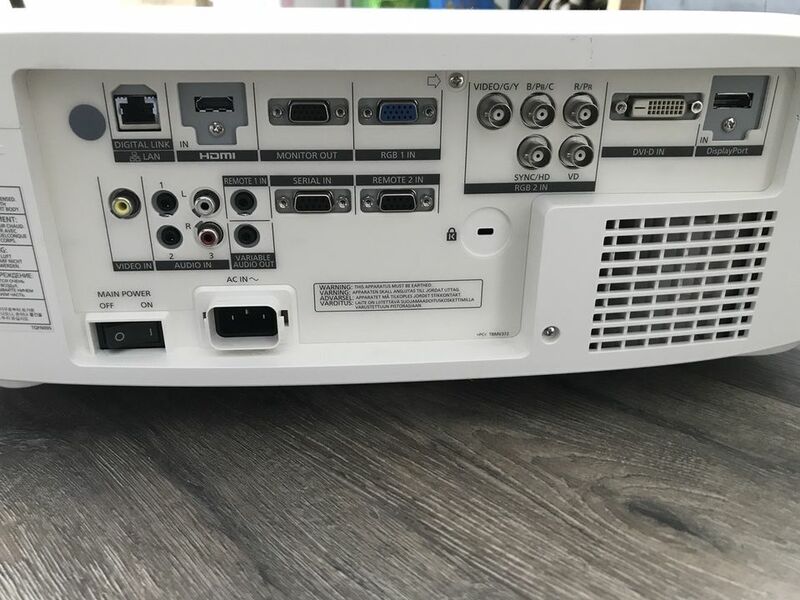 DisplayPort and DIGITAL LINK not included on PT-EW540/EW540L. 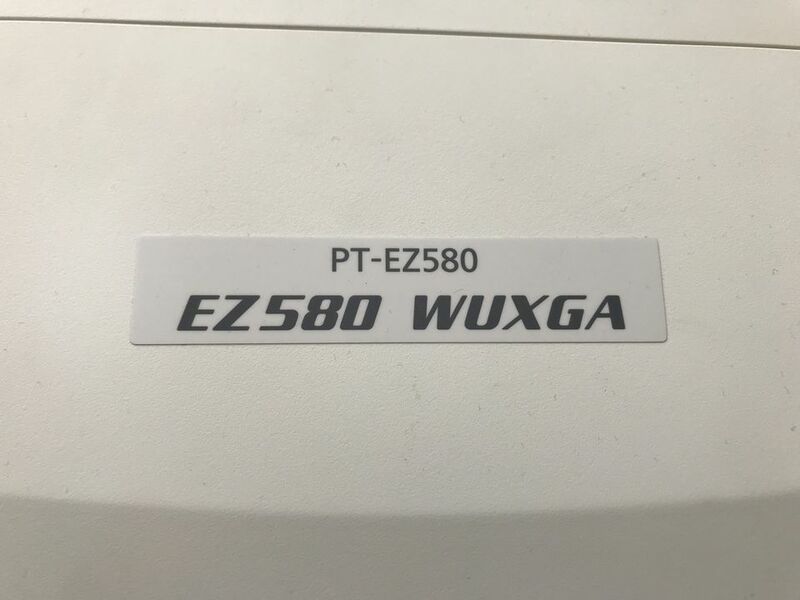 * The PT-EZ580L/EW640L/EW540L delivers the same performance as the PT-EZ580/EW640/EW540, but comes without a lens. *1 When the STANDBY MODE is set to ECO, network functions such as power on over the LAN will not operate. Also, only certain commands can be received for external control using the serial terminal. *10 The operating temperature range is 0 °C to 40 °C (32 °F to 104 °F) when used at altitudes between from 1,400 m to 2,700 m (4,593 ft to 8,858 ft) above sea level. 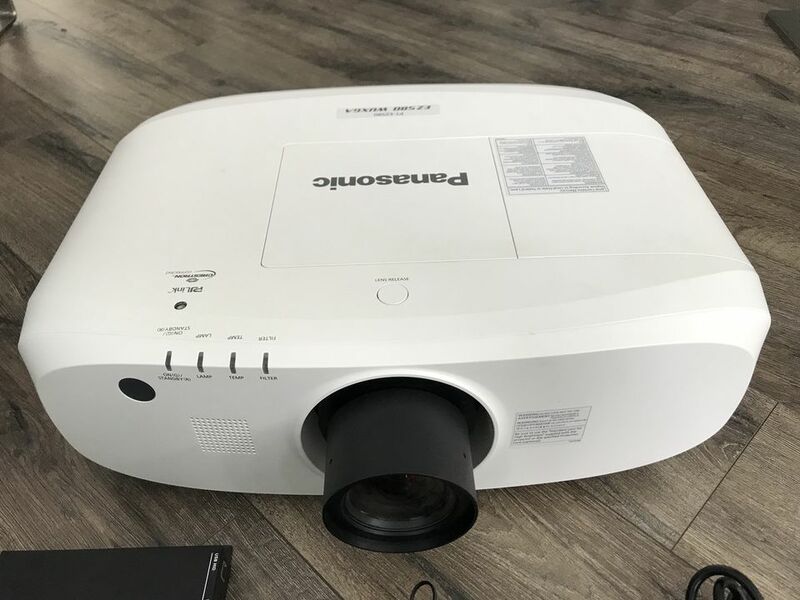 Also, if the ambient temperature exceeds 40 °C (104 °F) (35 °C (95 °F) at high altitude), the LAMP POWER may be automatically switch to Eco to in order to protect the projector. *11 Power cords available (x2) for Europe, the UK and Asia only.